Japan's PM Shinzo Abe is set to hold a last-minute meeting with Donald Trump, days before the US president meets North Korean leader Kim Jong-un. Mr Abe's visit is part of a surge of diplomacy ahead of the unprecedented summit on 12 June in Singapore. Few details of the agenda for the Trump-Kim meeting have been confirmed. When he meets Mr Trump in Washington on Thursday, Mr Abe is expected to push for Japan's security concerns to be reflected. Also on Thursday, Singapore's Foreign Minister Vivian Balakrishnan headed to Pyongyang to meet his counterpart Ri Yong-ho. Before a joint press conference with Mr Abe, Mr Trump said preparation was not essential for his meeting with the North Korean leader. "I think I'm very well prepared," he said. "I don't think I have to prepare very much. It's about attitude, it's about willingness to get things done." Mr Abe has held regular meetings with Mr Trump since the US president took office. 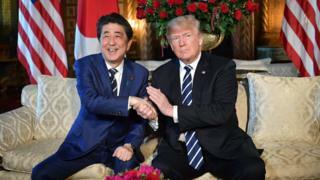 Once it was announced that Mr Trump intended to meet the North Korean leader - a break with decades of US policy - Mr Abe has been eager to brief him on Japan's concerns. There are worries in Tokyo that Mr Trump might strike a deal with North Korea that would sideline Japanese interests. Before departing for the US, Mr Abe said he would "meet President Trump to co-ordinate in order to advance progress on the nuclear issue, missiles and - most importantly - the abductees issue". Dennis Rodman: The Trump-Kim matchmaker? Throughout the 1970s and 1980s, North Korea abducted a number of Japanese citizens to help train its spies in Japanese language and customs. North Korea has admitted to 13 kidnappings but the real figure is thought to be higher than that. 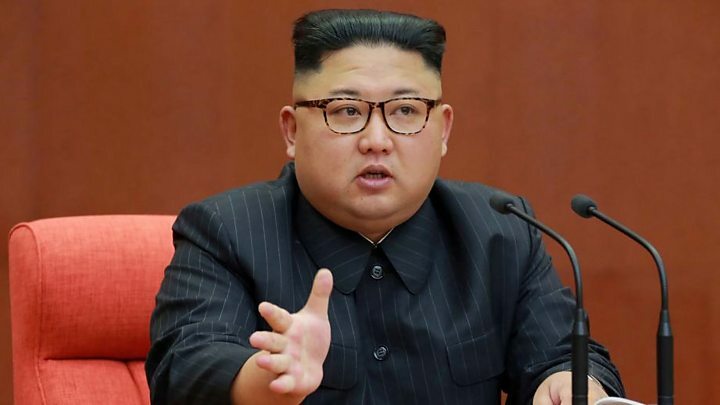 State news agency KCNA said the issue had been "resolved" and accused Japan of "hyping" the issue in order to harm the denuclearisation process. Japan also saw North Korea test missiles across its territory in the past year. Mr Abe's visit is part of a flurry of diplomatic activity in the run-up to the summit, as country's try to ensure their interests are not overlooked. Mr Kim has already had two meetings with South Korean President Moon Jae-in. Mr Moon went on to visit Mr Trump in the US. Russia's Foreign Minister Sergei Lavrov visited Mr Kim in Pyongyang, laying the groundwork for Mr Kim to visit President Vladimir Putin in Moscow later this year. Mr Kim has made two trips to China, meeting President Xi Jinping. Syria's President Bashar al-Assad said he intended to visit Pyongyang. After an escalation of rhetoric between US and North Korean top diplomats, Mr Trump last month briefly called off the talks. On Wednesday, Mr Trump's lawyer Rudy Giuliani said North Korea's leader "begged" for their summit to go ahead. "Kim Jong-un got back on his hands and knees and begged for it, which is exactly the position you want to put him in," Mr Giuliani said at a conference in Israel. Mr Giuliani, who is acting as lawyer for the US president in the Russia collusion inquiry, said the US was going into the summit in a position much stronger than North Korea.